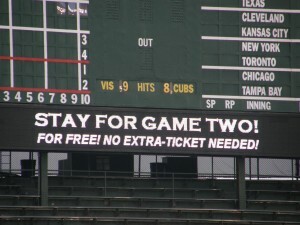 The Cubs Screw Fans with Day-Night Doubleheader | Have Game? Will Travel! Rain caused Tuesday night’s Cubs game to be rescheduled to Wednesday night setting up a day-night doubleheader. This was one of the first times I had not planned to attend a Cubs game, but was able to after the game was postponed. I brought the Ultimate Sports Baby to the first game of the day in what turned out to be a scheduling nightmare for the Cubs. First, even thought the Cubs scheduled the night game for 6:05 pm they never rescheduled the first game as they should have. The game time remained at 1:20 pm. In the past, they would have rescheduled the first game for 12:05 pm to allow for enough time in between games. 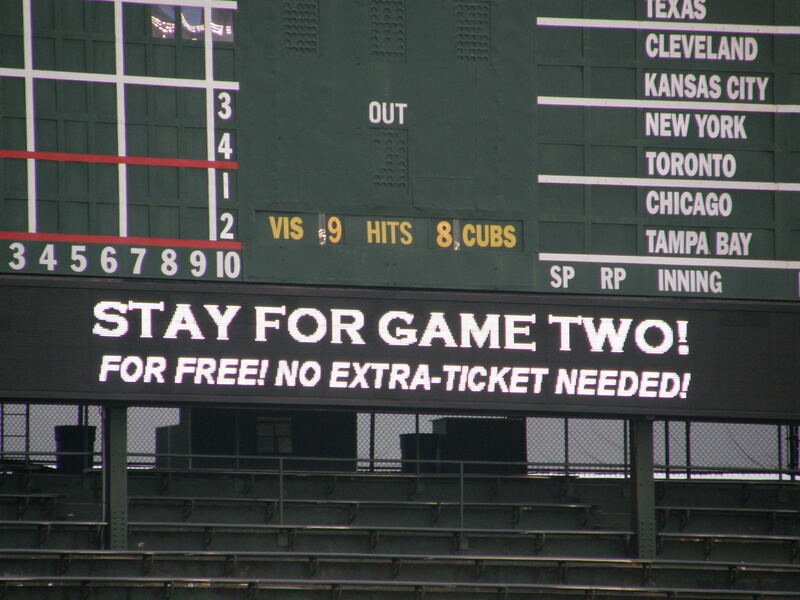 Or they could have just scheduled a straight doubleheader and allowed fans to exchange their ticket for Tuesday night’s game for a future game. Let’s face it; the Cubs are not selling out this season. But, no, the Cubs are now as greedy as any other team. So it was good to see the Cubs get screwed in their greediness. They obviously planned for the first game to last no more than 3 hours, which would allow 45 minutes to empty the stadium from the first game before opening the gates for the second game at 5:05 pm. This whole catastrophe would have been avoided if Carlos Marmol had not blown the save in the top of the 9th inning. The Cubs eventually won the game in the 11th after Reed Johnson homered on the third pitch of the inning.